Etelcalcetide is a novel intravenous calcimimetic for the treatment of secondary hyperparathyroidism (SHPT) in haemodialysis patients. The clinical efficacy and safety of etelcalcetide (in addition to phosphate binders and vitamin D and/or analogues [PB/VD]) was evaluated in three phase III studies, including two placebo-controlled trials and a head-to-head study versus the oral calcimimetic cinacalcet. 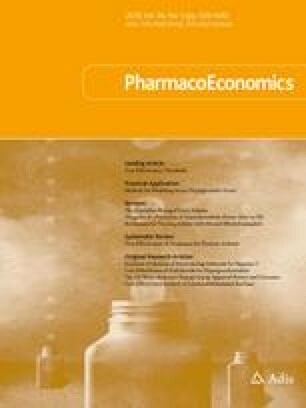 The objective of this study was to develop a decision-analytic model for economic evaluation of etelcalcetide compared with cinacalcet. We developed a life-time Markov model including potential treatment effects on mortality, cardiovascular events, fractures, and subjects’ persistence. Long-term efficacy of etelcalcetide was extrapolated from the reduction in parathyroid hormone (PTH) in the phase III trials and the available data from the outcomes study in cinacalcet (EVOLVE trial). Etelcalcetide was compared with cinacalcet, both in addition to PB/VD. We applied unit costs averaged from five European countries and a range of potential etelcalcetide pricing options assuming parity price to weekly use of cinacalcet and varying it by a 15 or 30% increase. Compared with cinacalcet, the incremental cost-effectiveness ratio of etelcalcetide was €1,355 per QALY, €24,521 per QALY, and €47,687 per QALY for the three prices explored. The results were robust across the probabilistic and deterministic sensitivity analyses. Our modelling approach enabled cost-utility assessment of the novel therapy for SHPT based on the observed and extrapolated data. This model can be used for local adaptations in the context of reimbursement assessment. The online version of this article ( https://doi.org/10.1007/s40273-017-0605-2) contains supplementary material, which is available to authorized users. Financial support for this study was provided by Amgen. The funding agreement ensured the authors’ independence in designing the study, interpreting the data, writing, and publishing the report. SI, MA, RA, PP and AB contributed to the development of the study through a consulting agreement with Amgen. BS, BD and VB are employed by Amgen and holders of Amgen stock and/or stock options. All named authors meet the International Committee of Medical Journal Editors (ICMJE) criteria for authorship for this manuscript, take responsibility for the integrity of the work as a whole, and have given final approval for the version to be published. The authors thank the Amgen biostatistical department for the support provided. Furthermore, we thank Kirsten Westerhout for valuable feedback within the later stages of the model development.